...bring May flowers... and boy, have we been getting April showers!!!! I don't know why I buy seed packets because I eventually end up buying the plants from garden centers, but I'm going to give it a go! 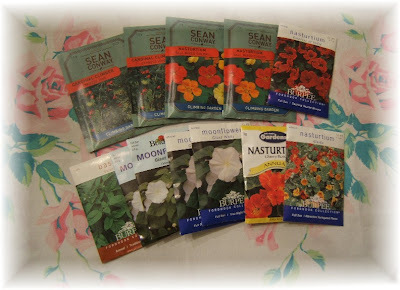 I am definitely planting basil this year, and I'm looking forward to trying a moonflower vine. I've never grown one before, but I've heard they smell heavenly! 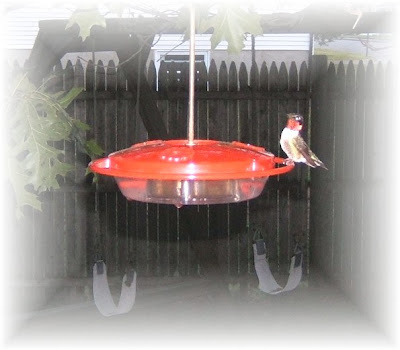 And even though I've never seen a hummingbird in our yard till May 10th or so, I've already hung my feeders...just in case! 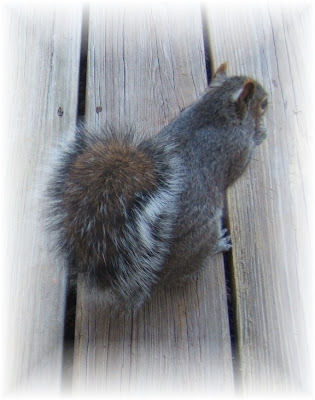 (I snapped this little guy in Aug 2005.) This is my favorite feeder. I even bought a second one this year. I like them so much better than the ones I used to have. Cleaning the saucer style is a breeze... there's no need for pipe cleaners because there aren't any tubes or crevices to clean out. Plus there's a perch all the way around. 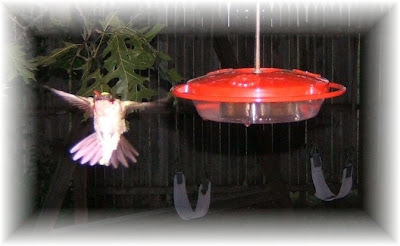 The hummers really do love to take a load off! They're always content to sit for long periods, sipping the sugar water, looking around for bugs, then sipping some more... It's always such a treat when they return in the spring! It won't be long now! Look at this little guy, hamming it up for the camera. I think it was his way of thanking me for all that yummy sugar water! Happy gardening to all of you! Oh my gosh... I NEVER knew this place existed and yet I've driven by it over a dozen times this past year. 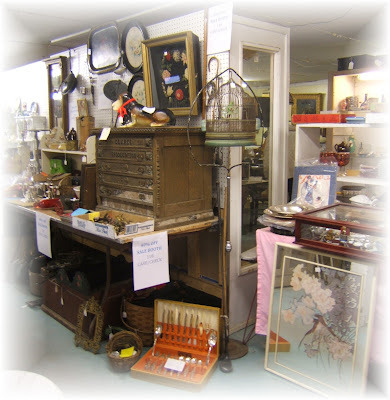 You've probably noticed that I'm hitting a lot of thrift shops lately. That's because I'm on a mission, searching for a very specific 'something' which I'll share with you in a future post. 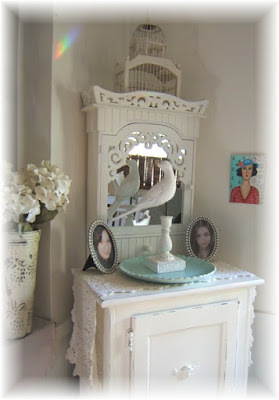 Look at that old birdcage! Isn't it gorgeous?? I had to keep repeating words 3 & 4 of my six word meme: Natural packrat, WANNABE MINIMALIST, Forever Conflicted... Remember Donna, WANNABE MINIMALIST. Stay strong! But how can I stay strong with all these treasures? 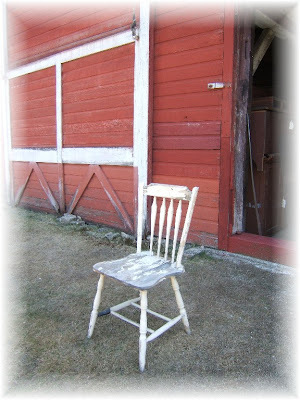 Just look at that rocker! 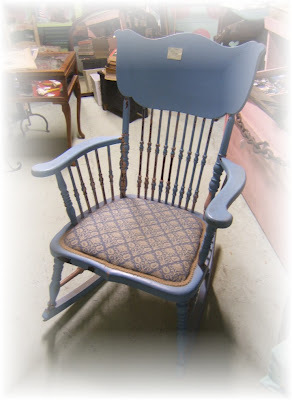 Periwinkle blue over a chippy pink and black basecoat... Can you picture how perfect that would be in my living room? The painting over my fireplace has all those same colors! Remember one of my previous posts about using old windows? Look at these! 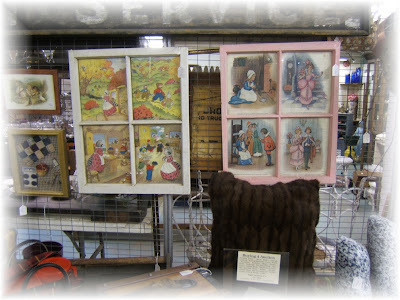 They have old illustrated storybook pages behind the glass panes... Such cottage charm! I think we had that old telephone back in the 60's when our telephone number started with two letters! 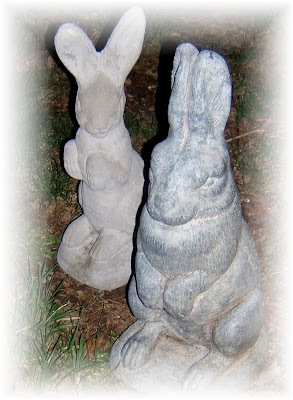 And look at that perfect chippy Mary garden statue! 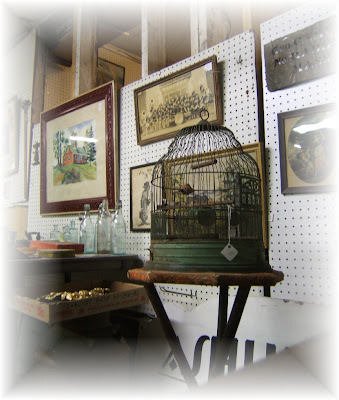 Oh my - another vintage birdcage, but this one has a stand and it's priced way less than just the cage alone in the first photo! Okay, I really, really tried to be a minimalist... honest I did... But I had to buy one of the items that is pictured above... Lots of the booths were running specials.. 20, 30, 40, even 50% off, so I couldn't pass up a 50% discount. I'll show you more photos of my purchase in a future post... I wonder if any of you have an inkling what it is ? And the hunt is still on for the specific item I'm looking for... I hate to be so mysterious about it, but it will become clear in a later post... So I'll be sure to take you along when I do some more junktiquing in the weeks to come! 1) You have to pick 5 blogs that you consider deserving of this award for their creativity, design, intersting material, and also contribute to the blogging community, no matter what language. 2) Each award has to have the name of the author and a link to his/her blog to be visited by everyone. 4) The award winner and one who has given the price have to show the link of "Arte y Pico" blog so everyone will know the origin of this award. So (drumroll please)..... 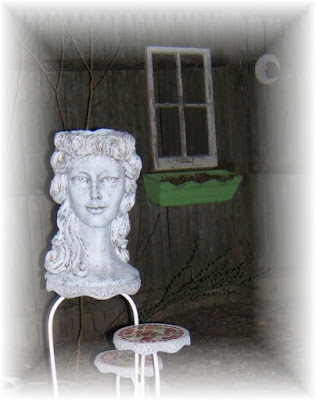 I love reading the blogs of these creative, clever, fascinating ladies... Thank you all for making my morning reading such an enjoyable experience! Okay, back to what I bought the other day... 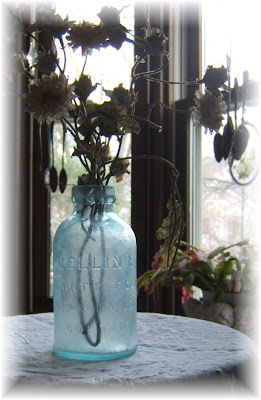 I am so drawn to cottage blue and robin's egg blue, so when I spotted this little blue bottle, I scooped it up. The raised lettering says "Mellin's Infant's Food Doliber-Goodale Co. Boston." I just stuck some dried flowers in it to photograph it, but I think it will make a sweet little vase for "fresh from the garden" flowers this summer! I found some just like it on eBay and it looks like the blue ones range between $13 and $15, so I'm very happy with my $4 price tag! At the same shop, I spotted this GORGEOUS robin's egg blue vase from several aisles over. Now I'm not into collectibles so I really don't know the value of such things. The vase had a raised peacock and flower vine design and I was surprised by the weight of it (quite heavy); it also had an old black & gold Fenton label inside. (I own a white hobnail Fenton candy dish, but had never seen this color... but like I said, I'm not a collector.) I was a little disappointed because the price was more than I wanted to pay ($21.00). 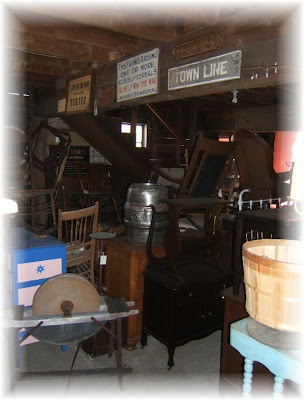 I asked the salesperson if the price was firm, and he said he would take 10% off, which brought it down to around $19. He said it's a rare Fenton color and it would sell quickly. I think I must have put it down and picked it up 3 times before finally bringing it up to the register. Again, I could just picture beautiful summer flowers in it... Well, the first thing I did when I got home was to look for the same Fenton vase on-line, and I found several going for $75, $150, and even $225, so now I don't feel quite so bad about what I paid! Of course those are mint condition, and mine has some faint (but stubborn) dirty spots... 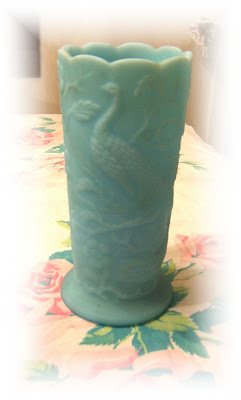 There's a blue Fenton peacock vase on eBay right now that's only $9 (with 4-1/2 days left on the auction). It's slightly different from mine as it is shiny (mine isn't) and it has the Fenton logo on the bottom (which mine doesn't, just the label inside), but other than that, it's pretty close! 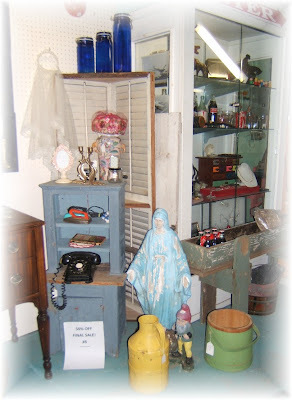 Remember the shop where I got my rose painting and Mary statue? 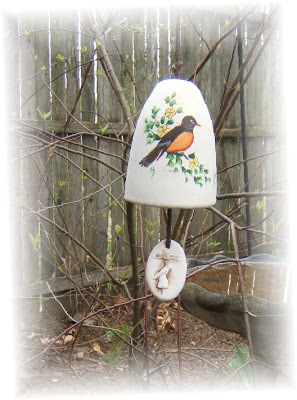 Well, I also found this cute robin wind chime for $1.50. 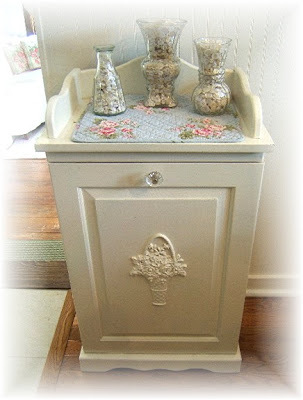 It's hand painted and is just adorable. I have to say that robins are one of my favorite birds. I have multiple bird baths in my yard, and the robins favor the deepest one. They just love to submerge themselves and flap their wings and splash to their heart's content. I can always tell when a robin has been in the bird bath because the water level is way down and the ground is soaking wet all around the bird bath! 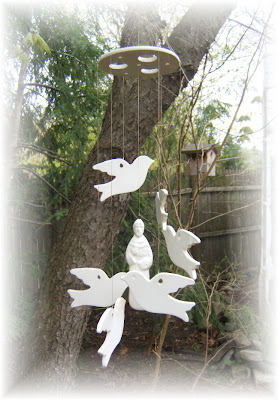 And last, but certainly not least, here is the other wind chime I bought. 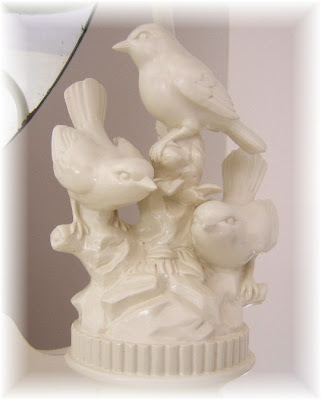 Remember the "white bird" hint I gave you? Isn't this sweet? 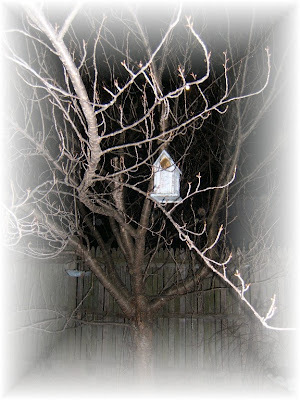 And St. Francis of Assisi is the clapper of the wind chime. I hung it in the yard to take a photo of it, but I think this will look really cute hanging inside the house in front of a window. It certainly fits in with my decor! 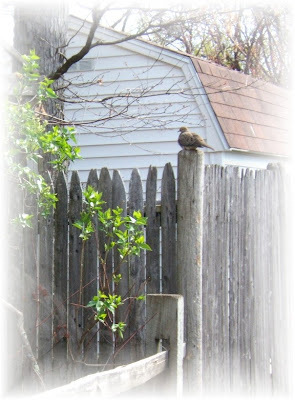 When I left the house today, I spotted this little mourning dove perched on the corner fence post in our yard. 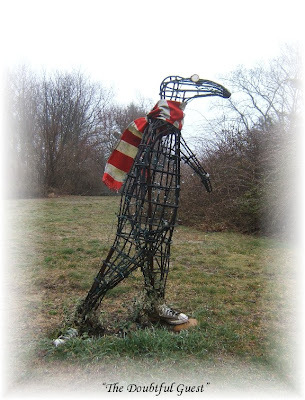 Since a good friend and I were just talking about 'birds on posts' yesterday, I had to snap this picture for her! 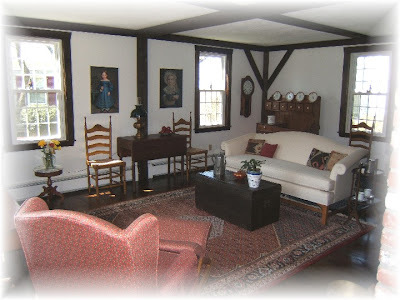 Remember this beautiful home that I stayed at on my last trip to the Cape? Here's a peek inside... isn't it lovely?? 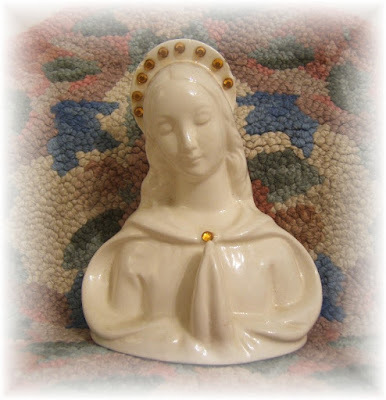 Below is the Mary that belonged to my mom. I have no idea how old she is, but my guess is that my mom bought her in the 50's or 60's. She hangs on the wall in my office. 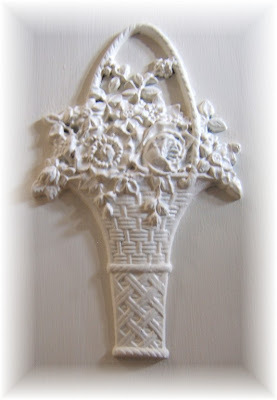 The beautiful necklace of glittery silver crosses is from Katie's Rose Cottage. 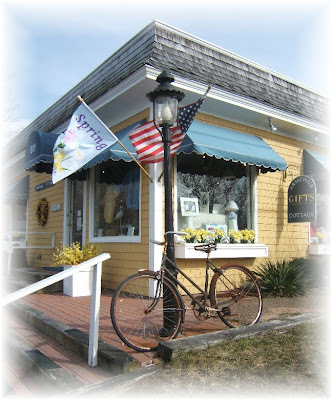 I've purchased so many items from Lori and I am always so thrilled with everything! Update: I've had several people ask where this lamp was purchased. It was Urban Outfitters. Click here for the source. 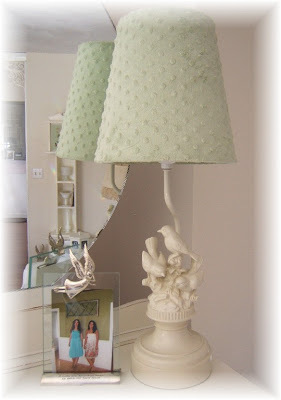 And click here to see my newest 'bluebird of happiness' table lamp and source. 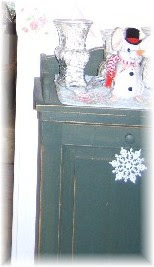 It's a small recycling center that I picked up at a craft show a few years ago. The front panel pulls down and there's a trash barrel inside. 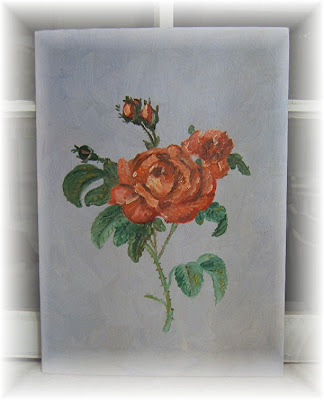 Even though the piece itself is small, the transition was quite dramatic. 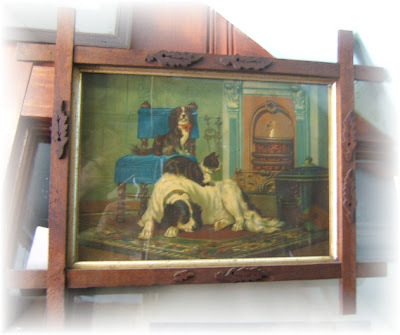 It was a very prim hunter green when I bought it, which looked great when the house was full of darker, primitive styled pieces. A little FYI... I have no idea why I decided to look this up, but according to "Google Translate," the French translation for "small cottage recycling center" is Petit chalet centre de recyclage... in Spanish it's Pequeña cabaña centro de reciclaje... and in Dutch it's Kleine cottage recycling Center, which easily makes Dutch my top choice should I decide to learn a new language as I already know three out of the four words!! Early this evening, I was able to get a couple of photos of Mama Squirrel in the birdhouse that her family has chosen to call home. I was able to get pretty close with the 'tail' photo (she couldn't see me coming), but had to stand a bit further back while taking the other as Mama S. was getting quite nervous as I approached. The moon was full and bright tonight... a perfect night to take a stroll around the yard with camera in hand. 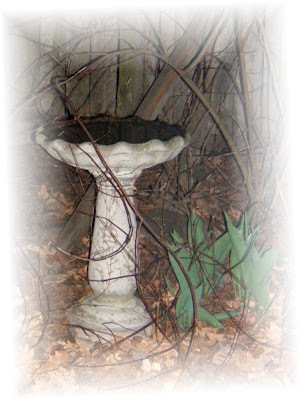 Except for a few perennials that have popped up, the garden is still bare... after all, this is New England. 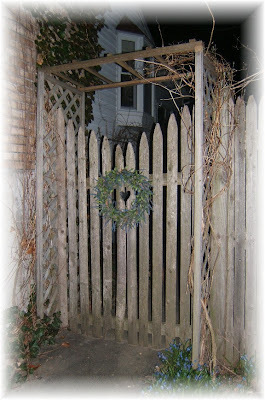 The clematis that climbs the arbor leading into the backyard is sprouting new shoots. Before long it will be covered in beautiful purple flowers. The cherry tree is just starting to bud. 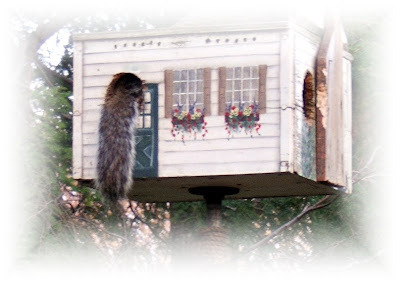 You'll notice that squirrels have enlarged the openings to many of our birdhouses. One of the houses actually has a mom, dad, and baby squirrels right now. I didn't photograph that one because I didn't want to startle them. Update: I just showed my husband these photos as he'd already gone to bed when I took them last night... After viewing them, he said it looked like we live in an overgrown cemetery! (I think it was the last picture with the 'hatless' woman bust that did it... 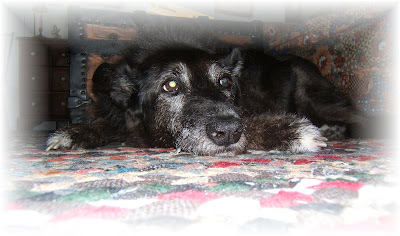 I don't think he's ever cared for her! 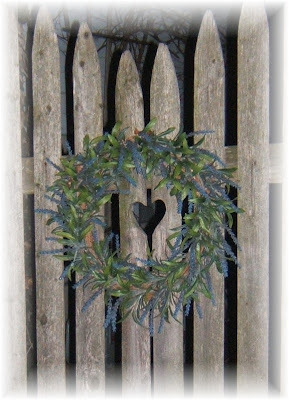 LOL) So just in case anyone else was thinking the same thing... rest assured, we don't live in an overgrown cemetery. 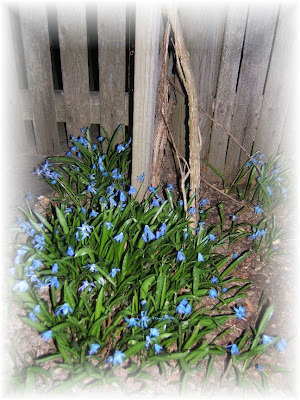 I'll post more cheerful daytime photos of the garden when things get planted and start blooming! I know... I know... I can hear you all now... "Oh, no! Not another one!" 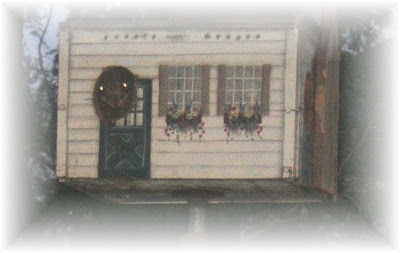 If I had it to do over again, I would have spent a little extra money and gotten bigger appliques for the three panels on the door. 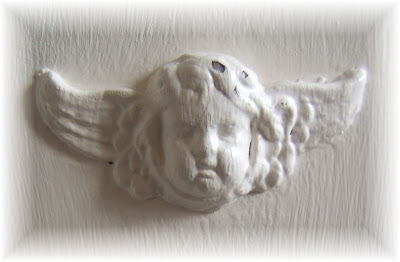 Those little cherub heads just look way too tiny, but once those appliques are adhered to the furniture, they are permanent!!! P.S. 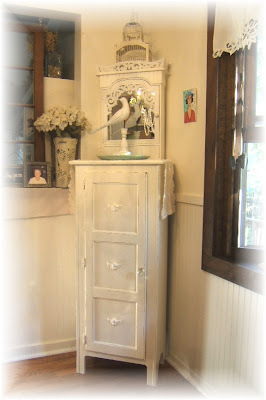 Don't you love the rainbow on the wall over the mirrored cabinet in the top photo? I have little cut glass ornaments hanging in all of my windows and when the sun is shining at just the right angle, the house is full of rainbows! 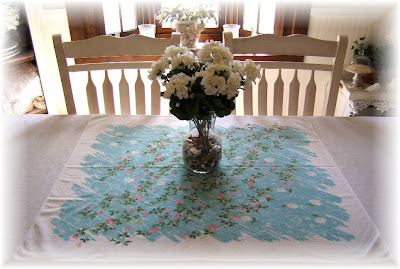 It was another warm day here in New England... a day for using tablecloths that celebrate the arrival of spring! Many of us in the colder climates get giddy with excitement at days like this... that delightful period between the harsh blast of winter and the stick-to-the-sheets humidity of summer. For me, spring is pure bliss. 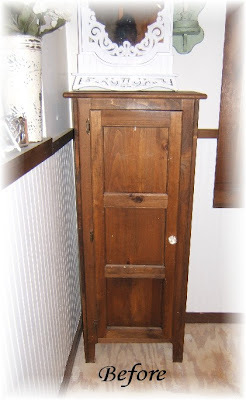 A while back I shared my mini-collection of vintage wastebaskets. I also have a small collection of tablecloths (vintage is a plus, but any pretty floral tablecloth is sure to catch my eye). From time to time, I'll share photos of some of my favorites, like this one with garlands of pink roses and daisies on a robin's egg blue background. interviewer: "what is your greatest regret?" 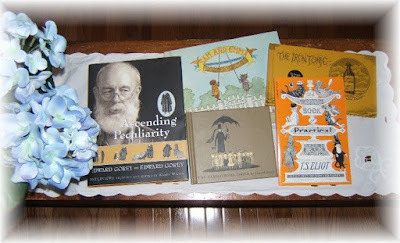 gorey: "that i don't have one"
Saying that Edward Gorey (1925-2000) was multi-talented is an understatement. 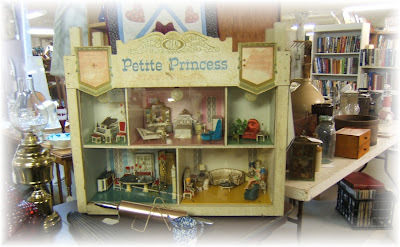 He was an author, illustrator, playwright, set and costume designer, and quite a private man. 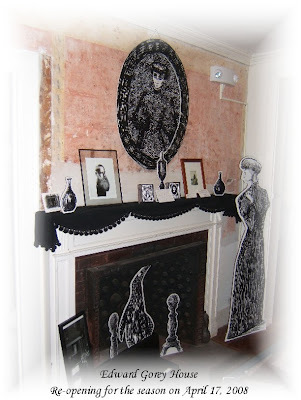 If you find yourself on Cape Cod this summer, I highly recommend you visit the Edward Gorey House located at 8 Strawberry Lane in Yarmouth Port, Massachusetts . 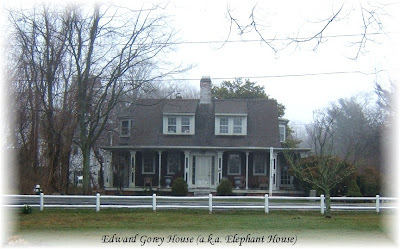 It is the actual house that Edward Gorey and his feline companions lived in until his death, eight years ago today. It was a wet, rainy day as I was leaving the Cape a couple of weeks ago, and the weather actually seemed quite appropriate to stop and take a few pictures of Edward Gorey House to share with you. The house is located off of (and visible from) scenic Rt. 6A/Old King's Highway. Spring ... where are you? ?